TAG Heuer today announced a landmark, long-term partnership agreement with Major League Soccer (MLS) and the U.S. Soccer Federation. The partnership, which commences on the first day of MLS’ 21st seaso – March 6, 2016 – will further establish TAG Heuer’s standing as a worldwide timekeeper for The Beautiful Game and challenge consumers and athletes alike: #DontCrackUnderPressure. The partnership is also inclusive of the Professional Referee Organization (PRO), the organization responsible for managing the referee and assistant referee program in professional soccer leagues in the United States and Canada. During MLS games, PRO referees will wear a Connected Watch, the innovative and newly launched smart watch in the TAG Heuer collection and a favorite among athletes. Each MLS referee will also be branded with the TAG Heuer logo on their uniform. Additionally, TAG Heuer will provide and be visible on the substitution board used on the sideline. As a premier luxury sports watchmaker, TAG Heuer will act as the Official Watch and Official Timekeeper of MLS and PRO. 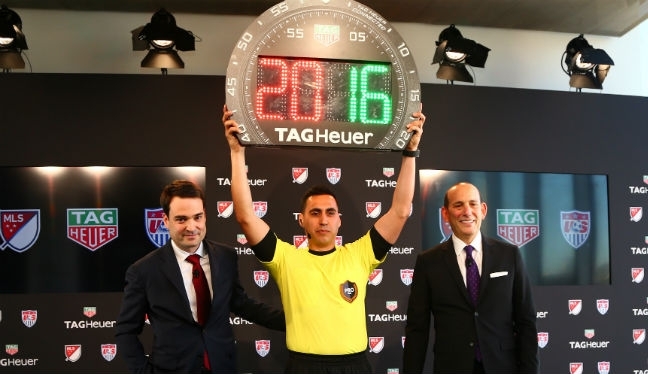 It will act as the Official Timekeeper of U.S. Soccer. Through the partnership, and by leveraging MLS’ and U.S. Soccer’s passionate and growing fan bases, TAG Heuer strives to further elevate its global status as a worldwide luxury watch brand and provider of unparalleled fan engagement. “Soccer is the fastest growing sport in the United States; and it is also most popular amongst the youth demographic, a generation we aim to connect with,” said Kilian Muller, President of TAG Heuer North America. “PRO and its officials are delighted to be associated with a brand of integrity and accuracy,” said Peter Walton, General Manager, Professional Referee Organization. For more information on TAG Heuer and their partnership with PRO, MLS and U.S. Soccer, please follow @TAGHeuer on Twitter, visit the Tag Heuer Facebook page, check out Instagram @tagheuer, or visit us.tagheuer.com.